The political success of the Kurds – the colonized – has intimidated not just the authoritarian AKP and ultranationalist MHP but also the nationalist, secularist, so-called social democratic CHP. 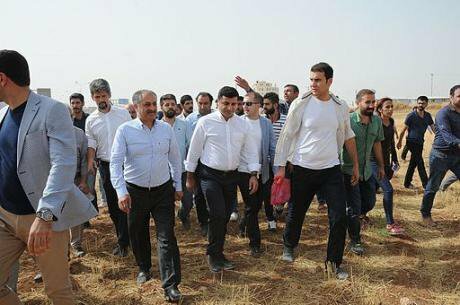 HDP supporters including Selahattin Demirtaş marching to Cizre after thir convoy was stopped by police. September 2015. Wikicommons/Mahmut Bozarslan (VOA). Some rights reserved.At time of writing, it has only been a month and a half since Turkey’s controversial referendum and the referendum has already fallen off the agenda in Turkey. Indeed, only a couple of days after the referendum, the Republican People’s Party (CHP), the second biggest party in Parliament, had instead begun discussing potential candidates for the presidency in the 2019 elections. The CHP, which represents itself as the main opposition party, did object to the election results and submitted an appeal against fraud to the European Court of Human Rights. The party’s leader also stated his disapproval of protests taking place in the streets and called on the crowds denouncing the election results to go back home. The party’s representatives now claim that their primary aim is to get ready for the 2019 elections so that they can ‘take Erdoğan down’ and replace him with another president who – like Erdoğan under the new presidential system – would have the power to override parliament and issue decrees. In a country where prisons are filled with dissenting voices (including MPs and elected mayors), where emergency decrees have increasingly deprived hundreds of thousands of people of their jobs, and 83 elected mayors have been replaced with government-appointed trustees, it would be naïve to think that CHP representatives really believe that the 2019 elections will be free of fraud and that Erdoğan would accept defeat. Why, then, did the so-called opposition party, which launched a “no” campaign against Erdoğan, object so meekly to the controversial election results and call its supporters off the streets? Today, as the authoritarian tendencies and aims of Erdoğan’s Justice and Development Party (AKP) have started to target ever larger swathes of the population, including that segment which enjoys the privilege of being Turkish in a nationalist and profoundly anti-Kurdish society, AKP polices have garnered broader international attention. Noting the policies enacted under the current state of emergency and the enormous powers that will be given to the president after the 2019 elections, commentators have claimed that Turkey is undergoing a historical transformation. While it is true that Turkey is going through a historical process of change, this shift has not come about just as a result of state-of-emergency policies which for decades have targeted Kurds and working-class Alevis living in the urban margins. No. For the first time in its history, in the elections of June 2015 Turkey witnessed the electoral success of a political party (the People’s Democracy Party, the HDP) emerging from the long criminalized Kurdish liberation movement that includes the Kurdistan Worker’s Party (PKK), a Fanonian party which adopts an anti-colonial resistance strategy against the Turkish State. Indeed, the establishment of an umbrella party that brings Kurds, socialists, feminists, LGBT activists, and critical Muslims together was an aspiration of the PKK leader Abdullah Öcalan, and the HDP was successful in realizing this aspiration. As a result of the election campaign carried out by HDP co-chairs Figen Yüksekdağ, the former chair of the Socialist Party of the Oppressed (ESP), and Selahattin Demirtaş, a Kurdish politician and human rights activist, the HDP passed the 10% threshold in Parliament by receiving 13.12% of votes (six million in total) and gaining 80 seats in the Parliament. The party did not only gain the majority of the votes in Turkey’s Kurdistan, where a significant percent of the population have voted for Kurdish candidates for years, but was also successful in the peripheries of the region and in western Turkey. Given the fact that Turkey’s ruling elites have been waging a systematic war against Kurdish civil politics for decades – a situation which Derya Bayır (2014) refers to as “politicide” – a systematic targeting of the Kurdish political leadership and its solutions to the Kurdish problem, the HDP’s electoral success was tremendously significant in ways that basic statistics cannot measure. This success not only endorsed the Kurdish liberation movement’s adamant insistence on civil politics in spite of the decades-long lawfare and warfare waged against Kurdish activists: it also demonstrated the possibility of the de-criminalization of stigmatized Kurdish political voices in the eyes of the Turkish public. Indeed, aware of the challenges posed by the HDP’s peace and democracy block and seeing the party as an existential threat, the AKP administration cancelled the June 2015 elections, refused to form a coalition government and hastened to re-initiate the war in Turkey’s Kurdistan. According to Turkey’s parliamentary system, if the party which came the first in the elections cannot form a majority government, it has to form a coalition government. And, according to the unwritten traditional rules, if that party cannot or does not form a coalition government, the President must then hand over the authority to form a government to the second biggest party in the parliament. However, Erdoğan did not follow this traditional rule and instead asked for early elections. Interestingly, the CHP leadership, who under normal circumstances would be responsible for forming the government, did not remonstrate against Erdoğan’s transgression of this rule. Actually, after the June elections, the CHP leadership objections to Erdoğan remained simply rhetorical and the party became partners with Erdoğan in the large-scale violence directed against Kurds in Turkey. Shortly after the elections in 2015, Turkish military forces occupied Kurdish towns, declared curfews, took lives and left hundreds of thousands of Kurds homeless and dispossessed. Throughout this process, Parliament granted immunity to military personnel who were “serving” in Kurdistan, while members of Parliament were stripped of their immunity with the goal of putting HDP parliamentarians behind bars – a move backed by MPs from the AKP, CHP and Nationalist Movement Party (MHP). As of today, thirteen HDP parliamentarians, including its co-chairs, have been imprisoned on the grounds of encouraging or supporting terrorism, and others expect to be arrested as well. Turkey’s long-suppressed Kurdish political struggle found an opening during the brief “peace process” carried out between 2013 and 2015, managing to become the second biggest opposition party in the country. It not only gained the support of Kurds but also Turks who for a long time had turned a blind eye to the various forms of violence inflicted on Kurds. At the same time, the PKK and its affiliate, the People’s Defense Units (YPG), took major steps toward building multi-ethnic and multi-religious autonomous areas of governance in Syria (Rojava) and in Iraq (Shingal), thereby becoming key actors in those regions. Yet, AKP, CHP and MHP consider PKK and YPG success outside Turkey a threat to Turkey and they all gave their consent to the Turkish military’s bombardment of the areas in Syria and Iraq that are under the control of these two related organizations. Recently, in April 25, 2017, for instance, Öztürk Yılmaz the Deputy Chairperson of the CHP, argued that Turkey has every right to fight against the PKK inside and outside Turkey, celebrated the AKP-led Turkish military’s air bombing of Derik in Rojava (Syria), and Shingal (Iraq Kurdistan) and argued that the military should have bombed these areas earlier. It should be noted that the founding national(ist) ideology of Turkey has crafted a narrative in which the Kurds, like other colonized peoples, are “uncivilized” and “ignorant,” and therefore incapable of ruling themselves. This ideology, of course, is not independent of the Turkish ruling elites’ treatment of Kurdistan and former Armenian lands in Turkey’s South East as an internal colony with Kurdish “subjects.” The political success of the Kurds, hence the colonized, has intimidated not just the authoritarian AKP and ultranationalist MHP but also the nationalist, secularist, so-called social democratic CHP. When the AKP appointed trustees to 83 Kurdish provinces and jailed elected Kurdish mayors and MPs, the CHP drew upon such a colonial mindset in its refusal to see those moves as a breach of democracy. The CHP gave its tacit consent to large-scale violence in Turkey’s Kurdistan by not objecting, instead adopting a stance of inaction, and choosing to be partners (in crime) with the AKP in silencing Kurdish political voices and putting the elected representatives of Kurds behind the bars. It was through just such a colonial mindset – so entrenched in the Turkish political imaginary – that a CHP deputy nevertheless had the audacity to say, in an interview with a Kurdish journalist after the referendum, that “Kurds’ biggest hope [for solving the so-called Kurdish issue] lay with the CHP” — presenting CHP as the future benevolent savior of the Kurds. The AKP and the so-called opposition in parliament are united in their enmity towards Kurdish political voices and practices that have taken action so effectively in Turkey and its neighboring regions. The political success of the Kurdish liberation movement both within and outside Turkey has prompted in those parties a sense of colonial envy, which not only drives them to devalue and criminalize the accomplishments of the colonized but also to try to erase it from the scene. In spite of their supporters’ fear of a non-secular and religious society, the secularist CHP’s alignment with an Islamist party proves that enmity against and fear of Kurds, who do not require their benevolence and already have an effective purchase on politics, is one of the key constitutive nightmares driving Turkish politics and/or its political imaginary. Today AKP and its partners in the Parliament are determined to deploy every means to suppress Kurdish political voices and being. Yet, history has also shown us that in spite of the systematic war against the Kurds, Kurds have been a major political force in Turkey over time and that violence against Kurds has not been successful in ending the Kurdish political mobilization. The residents of the cities and towns that suffered the most brutal forms of military violence after June 2015 elections, for instance, did not hesitate to vote almost exclusively “No” for the executive presidency. That is to say Kurds will not give up their struggle for democracy and their rights in Turkey and HDP will continue to attract social democratic votes, making it an even stronger rival to the self-proclaimed social democratic CHP. This rivalry, along with colonial envy, will make CHP a more anti-democratic and pro-violence party in the near future. In effect, the CHP, the biggest opposition party, will continue to legitimize and even strengthen Erdoğan’s power. A shorter version of this piece was published at PoLAR Forum on May 11, 2017. I would like to thank Mehmet Rauf Kesici, Barış Ünlü and Mehmet Kurt for their comments on the earlier version of this piece. Bayır, Derya. "The role of the judicial system in the politicide of the Kurdish opposition." The Kurdish question in Turkey: New perspectives on violence, representation and reconciliation (2014): 21-46. Beşikçi, İsmail. International Colony Kurdistan. Taderon Press, 2004.